The patriarch of F Is for Family, Frank Murphy (Bill Burr), is an angry dad and husband who manages an airport's baggage claim. 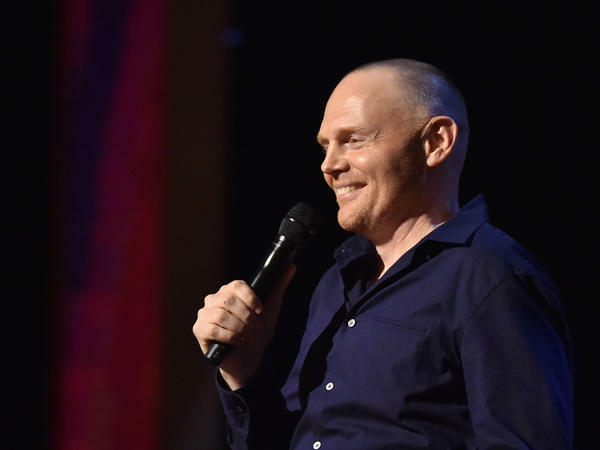 Comic Bill Burr performs at Beacon Theatre in New York. Frank and Sue Murphy are raising a family in an age before arranged play dates, mandatory seat belts and helicopter parents — a time Bill Burr remembers fondly. 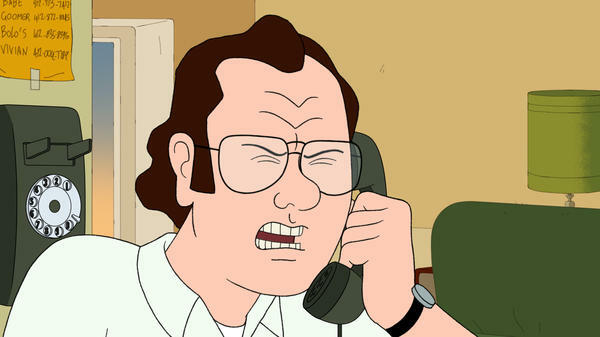 It's called F Is for Family, and its patriarch is the often-frustrated Frank Murphy. We learn Frank's back story in the opening credits: On high school graduation day, Frank dreamed of being a pilot. You see him soaring carefree into the sky when suddenly the debris of life starts smacking him in the face — a draft notice for the Korean War, a baby bottle, a wedding cake. Soon Frank is wearing glasses, growing a belly and losing his hair. His face turns from eager anticipation to fear, and he crashes back to Earth. "That whole part of his life happened quicker than he wanted," Burr says. Frank gets his girlfriend pregnant, and a wife, three kids and a mortgage later, he's given up his dream of becoming a pilot. Instead, Burr says, "He works at the airport every day and sees his dream take off and land while he sits there managing baggage claim." But he's still a good guy, even if he is angry and deflated. "I think a lot of people who play by the rules have a temper," Burr says, "because they watch people passing them in the breakdown lane and end up flipping out." Still, Frank and his wife, Sue, are doing the best they can. They're raising a family in an age before arranged play dates, mandatory seat belts and helicopter parents — a time Burr remembers fondly. "What I loved about back then is you just went outside," he says. "My mother would just say, 'Go outside,' and you'd walk outside, meet your friends and then, as kids, you would meet another group of kids, and then, with your kid brains, you would decide what you were going to do that day. Sometimes it was play baseball and sometimes it was, 'Let's go break some windows or throw rocks in people's pools.' "
F Is for Family takes place in 1973. With simple, realistic lines, it even looks like it was animated in the '70s. (The animators were inspired by Hanna-Barbera Saturday morning cartoons and King of the Hill.) Burr says he got the idea for his adult "cartoon," as he calls it, because he has so many riotous stories about his family, and especially his dad, who had five kids by the time he was 33. Those stories — of his father's angry outbursts and how his mother dealt with them — often make it into Burr's stand-up (along with plenty of expletives). 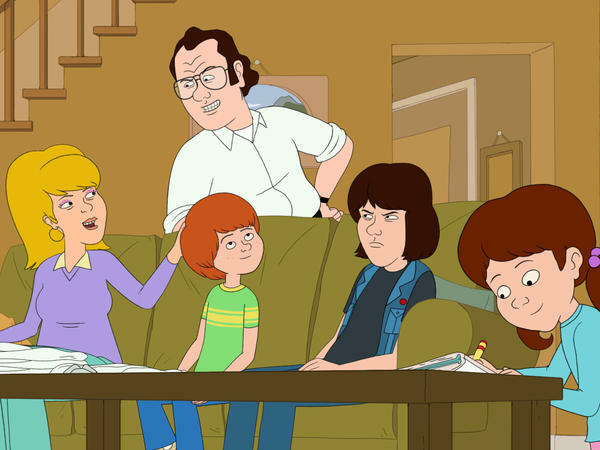 F Is for Family co-creator Michael Price can relate to Burr's experience of paternal anger. Price has been a writer, animator and executive producer on The Simpsons for nearly 14 years. Like Burr, he was raised in an East Coast Irish-Catholic family in the 1970s and had plenty of time for mischief. "We didn't have supervision," Price says. "It was ... the perfect time to be a kid, but also dangerous. You could've been killed easily by not wearing seat belts. Everyone was smoking." One of Price's memories involves mosquito control trucks that would make the rounds on summer evenings in his New Jersey neighborhood: "It went through neighborhoods very slowly, blowing out this incredibly dense fog of pesticide. ... Our parents let us run outside ... and walk behind the truck. It was this incredibly fun event — every kid would walk, slowly breathing in the fog. It had kind of a sweet smell. God knows what disease I caught those nights." "We would just ask people about their childhoods," Burr says. "And if it was too nice — like, 'Oh, it was great. There was always an apple pie cooling in the window' — we were like, 'OK, take it easy.' But if they were like, 'My brother used to throw me down the stairs,' we were like, 'All right, let's see what you got. Send us some scripts.' "
And let's turn now to a television tradition - the portrayal of the American family. Netflix is getting into it with the new animated comedy that premieres tomorrow "F Is For Family." The series is set in the 1970s and, as the title suggests, it is for adults. Think of an R-rated mashup of "All In The Family" and "The Simpsons." NPR's Elizabeth Blair has more. ELIZABETH BLAIR, BYLINE: The patriarch in this family is Frank Murphy. He's got a wife, three kids and likes to think of himself as the king of his blue-collar cul-de-sac. We learn his back story in the opening credits. BLAIR: It's a 45-second recap that begins with Frank throwing his high school graduation cap in the air. Frank dreamt of being a pilot, so the animators drew his body soaring, carefree, into the sky. Pretty quickly, the debris of life smacks him in the face - a draft notice for the Korean war. REDBONE: (Singing) Come and get your love. BLAIR: A baby bottle, wedding cake, electricity bills, kids' bikes - Frank ends up not a pilot but a manager at an airport baggage claim. "F Is For Family" is the brainchild of standup comedian Bill Burr. BLAIR: ...And a deflated, angry guy - also blunt, like when his kids are talking while he's trying to watch TV. JUSTIN LONG: (As Kevin Murphy) Pretty great, huh? BURR: (As Frank Murphy) Hey, I spent 700 bucks on a TV so I could watch a family being happy. So zip it. BLAIR: Frank and his wife are doing the best they can. LAURA DERN: (As Sue Murphy) Have fun. Come home when the streetlights come on. BURR: (As Frank Murphy) Don't go playing with those dirty kids down the end of the block. They probably have chiggers. REINHART AND DERRYBERRY: (As Bill and Maureen Murphy) We won't. BLAIR: "F Is For Family" takes place in 1973. It even looks like it was animated in the '70s. Simple lines, realistic - like Hanna-Barbera or "King Of The Hill." Bill Burr had the idea to do this adult cartoon, as he calls it, because he had all of these stories about his family that sometimes make it into his standup. His dad had five kids by the time he was 33. BURR: The pressure of that - feeding all those kids. Man, I'm telling you, every three or four days he would just snap - just snap out of nowhere, you know? Can you pass the salt? [Expletive] Boom, he'd slam the door, have the car in third gear by the time he got it to the end of the driveway. BLAIR: Burr says there's some of his dad in Frank Murphy. There's also some of Michael Price's dad. Price cocreated "F Is For Family." He and Burr are cut from the same gently-soiled cloth. Both grew up on the East Coast in Irish Catholic families in the 1970s. MICHAEL PRICE: We didn't have play dates. We didn't have supervision - perfect time to be a kid. But it was also incredibly dangerous time where (laughter) you know, you could have been killed easily by not wearing seatbelts and, you know, everyone was smoking. BLAIR: ...Or get inside big, empty oil drums and roll down a bumpy hill. UNIDENTIFIED ACTRESS: (As character) Oh, it's gone too far. BLAIR: When Burr and Price were hiring writers for "F Is For Family," they always asked people about their own childhoods. BURR: If it was, like, too nice, like, oh, it was great, there was always an apple pie cooling in the windowsill, we were like, all right, take it easy. But if they were like, yeah, my brother used to just throw me down the stairs for no reason, like, every other Wednesday and I couldn't figure out why, we were like, all right, let's see what you've got, send some scripts (laughter). BLAIR: The Murphys are imperfect but all too real. And that's what makes them funny. They're people you might recognize from your own childhood. Elizabeth Blair, NPR News. REDBONE: (Singing) Come and get your love. Come and get your love. Transcript provided by NPR, Copyright NPR.